A recent public records request made by the Boston Globe shows the state has failed to regularly inspect approximately 75 percent of the escalators in Massachusetts malls. From 2008 to 2010, only 44 of the state’s 188 mall escalators received annual inspections as required by law. Inspectors missed one or two inspections during those three years on 144 escalators. When mall escalators were inspected, they needed repairs in more than half the cases. Mall escalators were shut down 22 times. The newspaper made the public records request following the wrongful death of 4-year-old Mark DiBona last month in an escalator accident in a Sears department store at the Auburn Mall near Worcester. The child fell through a 6-inch-wide gap between the handrail and the glass barrier. The state Department of Public Safety suspended the two inspectors who approved the defective escalator for use. The state’s failure to inspect its escalators dates back at least 15 years. In 1995, the Globe reported that nearly 40 percent of the state’s escalators and elevators had expired inspections. The state currently has 34,000 elevators and 900 escalators for 51 inspectors to examine. Two dozen of those positions were created in 2010, the same year an audit found that nearly a third of the state’s elevators and escalators had expired inspections. Fifty one inspectors is the most the state has had in years, though some specialists say they still carry a heavy workload. Beyond staffing, some specialists in the field say that inspectors spend more time on elevators and are less experienced with escalators, which may contribute to escalator accidents in Massachusetts. To read the Boston Globe article reporting this data, click here. The Massachusetts escalator accident lawyers at Breakstone, White & Gluck are experienced in handling cases involving personal injury, wrongful death and defective products. If you have been injured in a Massachusetts escalator accident, contact us today for a free consultation to determine your rights. Contact us at 617-723-7676 or 800-379-1244 or use our form. 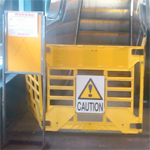 Tagged: "defective elevators", "defective products", "escalator accidents", "mall escalators", "Massachusetts escalator accident lawyers", "Massachusetts escalator accidents" and "personal injury"